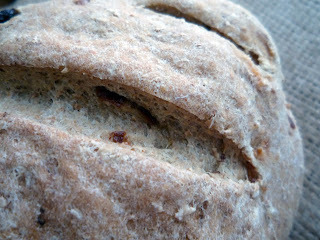 This is a hearty but sweet rye bread. I am really enjoying Bernard Clayton's 'New Complete Book of Breads'. I think it was the best $3.99 that I've spent lately! Add to sponge. Knead in 1 1/2 cup whole wheat flour and 1 1/2 cup all purpose flour. Knead until smooth. Rise one hour. Shape. Bake one hour. Wow, that looks like such a perfect loaf.